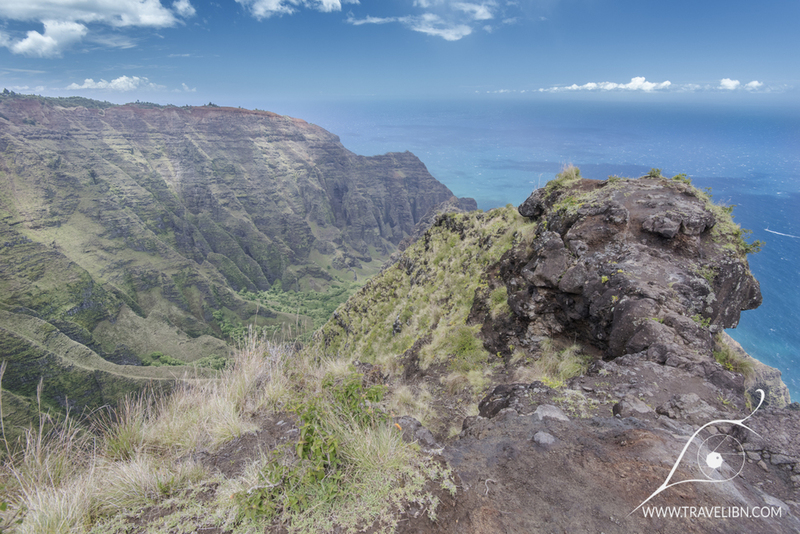 Awa’awa’puhi Trail is one of the few officially maintained trails in Koke’e State Park offering a close view of the Na Pali Coast and its magnificent cliffs. 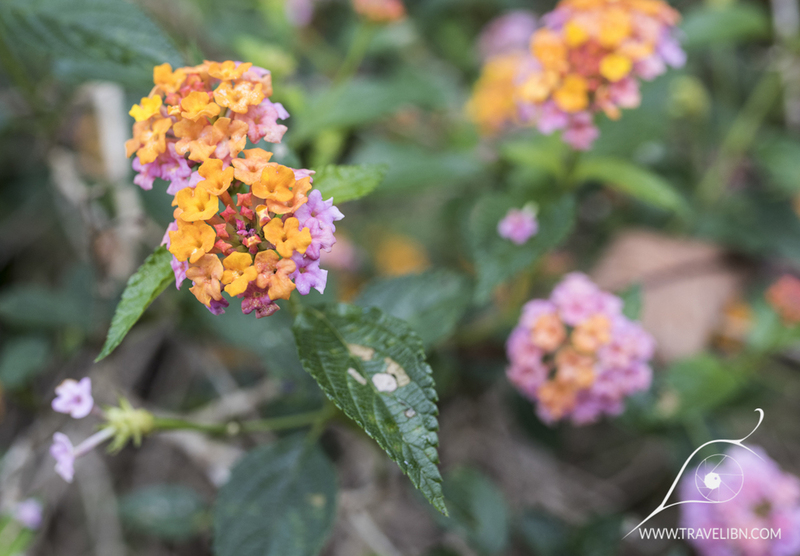 This 3.2 miles (5.1 km) each way, out-and-back, half-day hike runs through a gorgeous rainforest, changing into a semi-arid desert half way through it and ends with a sweeping view of two neighborhood valleys- Awa’awa’puhi and Nu’aolo Aina. It’s a similar, albeit shorter and easier to accomplish, hike than the Nu’aolo Valley trail we described earlier. 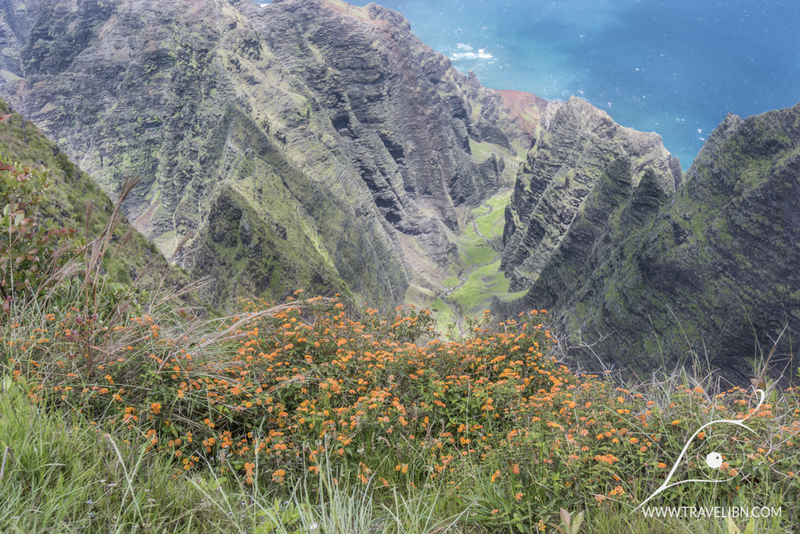 The main difference between the two trails is the view from the endpoint lookout- no two Na Pali Coast valleys look alike and therefore we recommend doing both Awa’awa’puhi and Nu’aolo Valley trails if time allows you to do so. There used to be a trail- Nu’aolo Cliff Trail, that connected the two into a strenuous loop hike, however it got closed due to severe erosion and there is no plan to re-open it anytime soon. People still stubbornly try to hike the Nu’aolo Cliffs despite the signs warning not to, but from what I’ve read, the erosion is truly severe to the point where parts of the trail are less than 6 inches wide and the risk of falling down the cliff is really high. 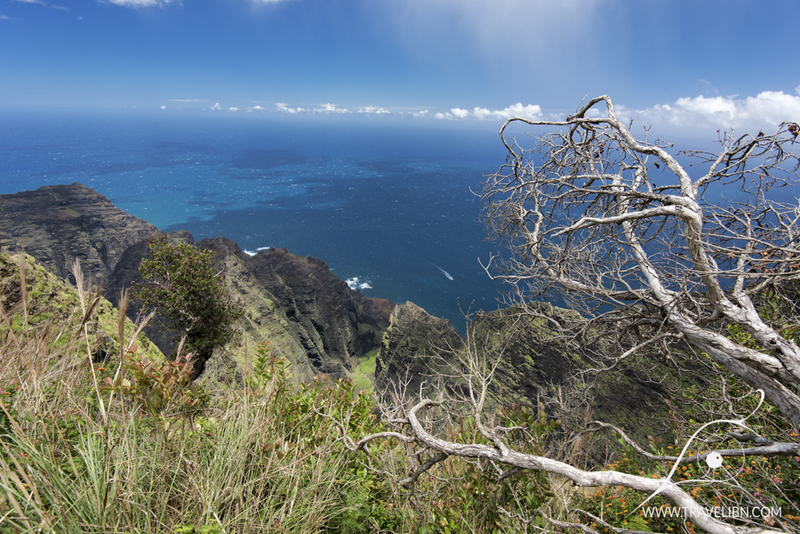 It’s better to do these two trails (Awa’awa’puhi & Nu’aolo Valley) on separate occasions and spend some time at the viewpoint as it is truly spectacular. 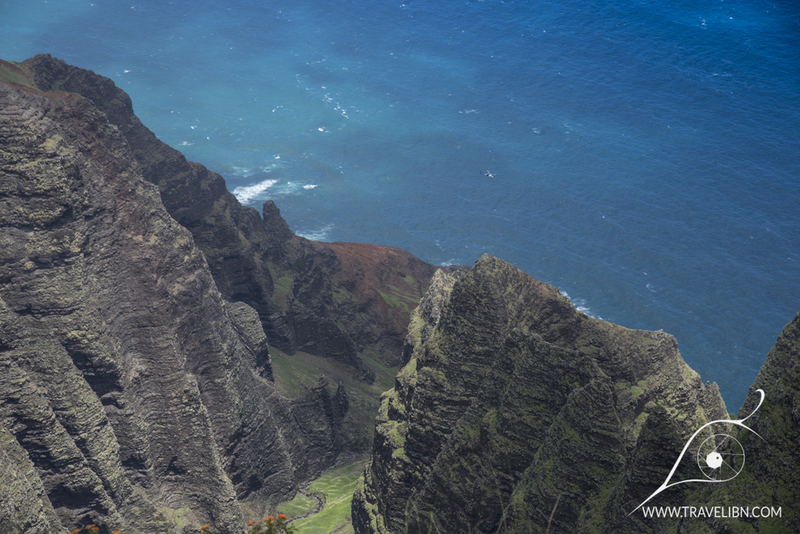 Awa’awa’puhi Valley is the deepest of Na Pali coast valleys and also the narrowest, making its steep, almost vertical walls absolutely breathtaking to look at from above. The name derives from Hawaiian word ‘awapuhi, which describes shampoo ginger that grows on the valley floor and away, meaning valley. Another version of the name origin involves an eel (puhi in Hawaiian language) named Kuna that swam by the valley and, interested by its unusual shape, decided to explore it. Kuna slithered through the cliffs, shaping them as it passed by. Eventually, he went asleep at the valley, completing the “sculpture”. First of all (and I repeat myself)- don’t try to ignore warning signs and attempt to hike the Nu’aolo Cliff Trail connecting Awa’awa’puhi with Nu’aolo Valley trails as it is impassable. There is a lot of misleading info online stating that the trail is open, but that is simply not true. To get the info on trail status visit LINK or ask the ranger at Koke’e Museum. Awa’awa’puhi Trail head is located in the Koke’e State Park boundaries, right after Mile Marker 17 on park’s main road, Hwy 550. There is a parking lot on right of the road few steps from the trailhead. 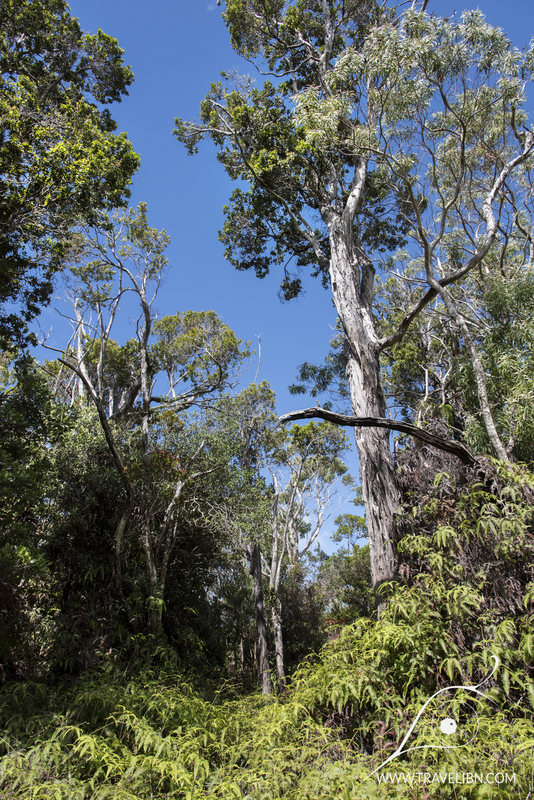 Beginning of Awa’awa’puhi trail takes you to a high forest of introduced and native plants. If you look closer, you can find signs describing some of the more interesting species. The entire hike towards the valley leads downhill and you know what that means going back. 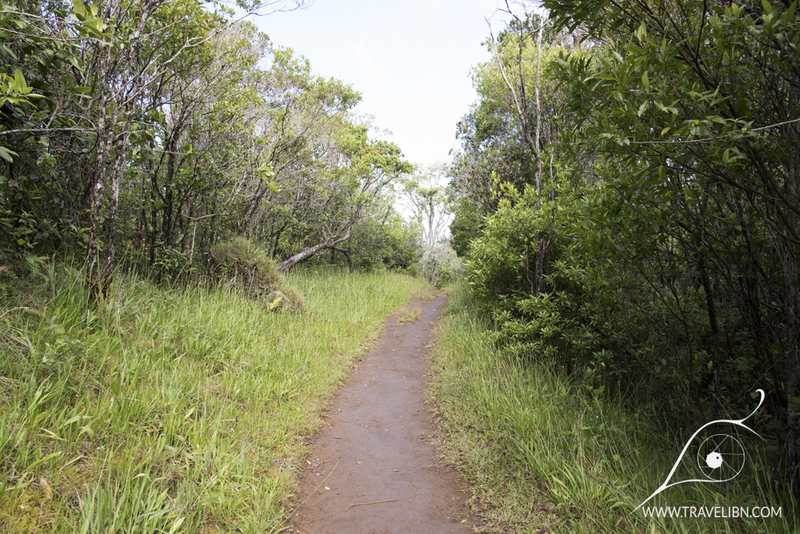 After about a mile (1.6 km), vegetation starts to be more spread as you’re getting closer to Na Pali. 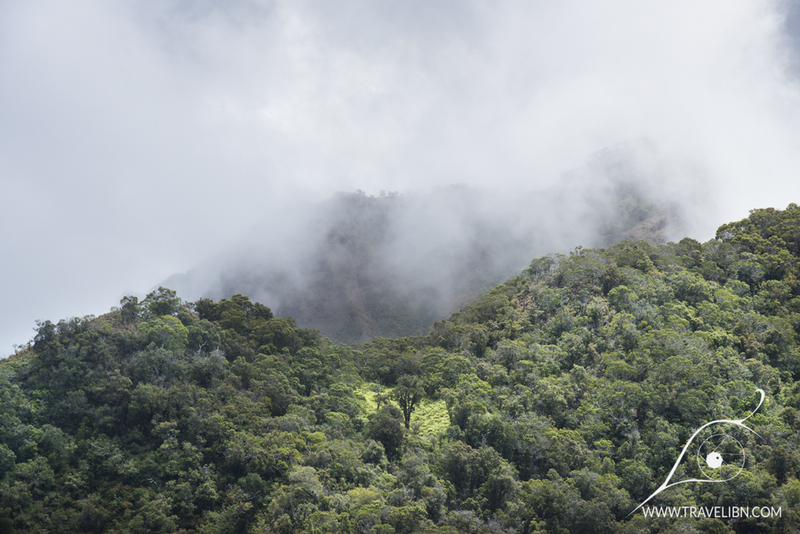 Half-way into the trail, landscape starts changing again as the jungle gives away to arid climate adapted vegetation. 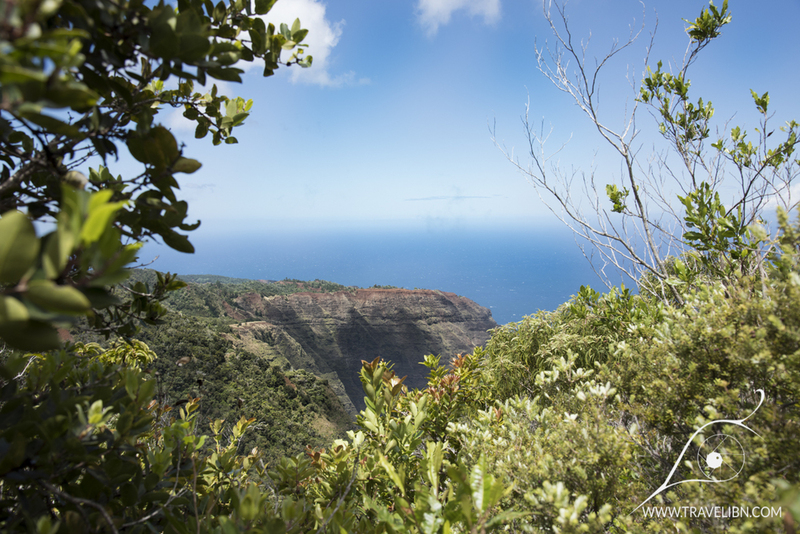 As you’re getting closer to the ocean, the valley shows up and around ¾ of the way, you’ll encounter an intersection with Nu’aolo Cliff Trail. 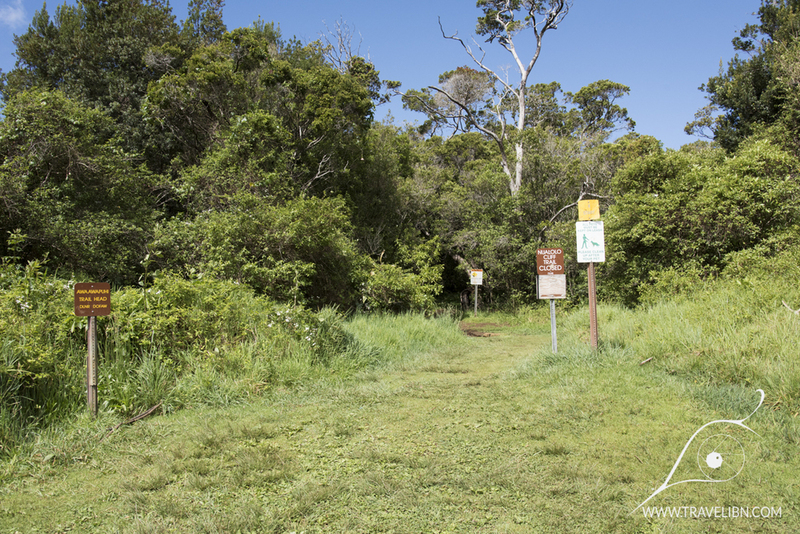 If there’s a sign stating the trail is closed, do not go and instead continue straight for another 0.2 mile (0.3 m) to Awa’awa’puhi Nu’aolo Lookout. The view standing 2,500 ft (760 m) above sea level, looking down on incredibly steep “pillars” of Awa’awa’puhi, the stream zing-zaging on the valley floor, is an unforgettable experience. There’s a good chance you will be sharing the view with a family of resident chickens and Red Crested Cardinal. Take tour time to memorize this amazing view and prepare for the more difficult hike back to the road.